scuttle is an open source replacement of delicious. Scuttle is an open source replacement of delicious. It is build in php and uses mysql as database. Scuttle is very fast and as easy to use as delicious. Most important, it is open source and it runs on your server! When you are running Debian then installing scuttle is a piece of cake. Just make sure you have mysql-server installed. If not, install it with "apt-get install mysql-server". Install it with "apt-get install scuttle". Restart it with "/etc/init.d/apache2 restart". Now point your browser to http://<ip-number>/scuttle/ and register as a new user. Now point your browser to http://<ip-number>/scuttle/ , login and hit the import-button. 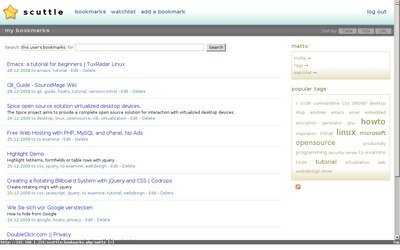 When you have added new bookmarks to delicious it is possible to import them into scuttle. Just download the xml-file again. Then open http://<ip-number>/scuttle/import.php. Scuttle is smart enough not to import the same url twice. So this is a nice way to keep scuttle in sync with delicious.